Quiltville's Quips & Snips!! : Galaxy-Gram! Good Intentions of Border Stuff! Where you thought you were going to get a lot of sewing in, but everything else that has been left undone for 2weeks suddenly takes precedence and sewing time is once again pushed toward the back burner. Sometimes, it's really really good! Like a late afternoon massage appointment, very much needed, and a light dinner after with a friend that you have missed repeatedly due to crazy schedules and cars with dead batteries. Of course, there must be a run by the ATM on the way home, and text messages reminding you to stop and pick up milk and a few other things at the grocery store since you are driving right past it on your way. Once the car is unloaded, you finally look at the clock on the stove to find it is after 8 p.m. And the day is gone, long gone! But that's okay! Evenings are for unwinding, and the next two weeks are for taking time at whatever pace I need to to catch up , to relax, and there is time to finish this baby quilt tomorrow. Borders have been chosen! I've decided on the darker blue for the inner order, and the blue check for the outer border and the binding will be the same red as is in the quilt center. Some days are for just making decisions, and the next day can be for following through. If you haven't checked out the Mystery Monday Link-Up, Part 3 from this past Monday, go see it! New entries are coming in every hour, and we've got quite the array of wonderful part 3 units on display. The link-up closes tomorrow night, Thursday, December 18 at 11:55 p.m. Eastern Standard Time. Oh yeah, I guess I better get going on writing part 4 because it goes live on Friday morning! But for now all I feel like is curling up with a book, a purring cat, and a snoring dog for a long winter's nap. I hope your Wednesday was a wonderful one! Funny that last Tom was part of cast ha but ended up int the wrong spot! It sounds perfect. 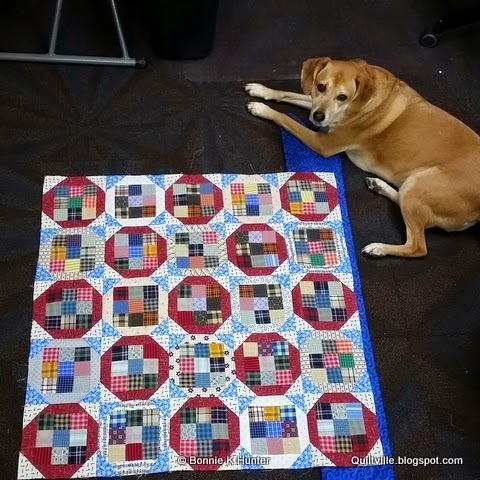 I am loving this quilt and need to put it on my to do list. I need to make a little dent in all these scraps. But first I must finish this mystery. I am enjoying it more each step. Thank you for doing this for us. No whining here. Hope you get some relax time too. The book, cat and dog sounds like a very nice idea. It keeps getting better...I love the border too! You continue to amaze me! 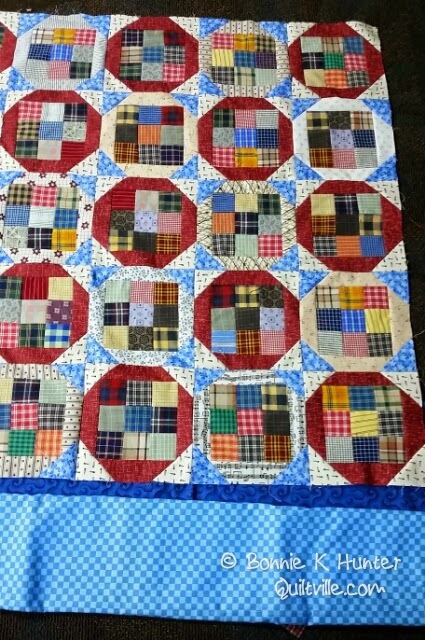 The quilt is looking even better than I imagined from the Previous pics. Glad the new baby gets a fun Bonnie Quilt. I'm haveing fun catching up on the clues before Friday. I'm almost there! yea!! 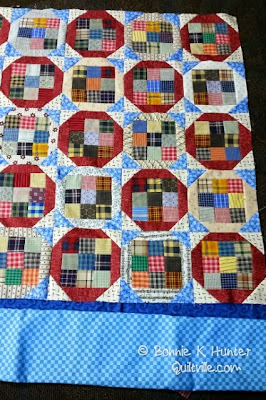 This babtquilt is looking gorgeous!! I just love how those "snowballcorners" turned out! And the borders are so perfect with it. make that a snoring husband and a pot of tea and you have the ideal day at melanie's mansion! I love your inner/outer border choices... and how those hour glass blocks are formed when sewing the 9 patch centered blocks together. I am sure that was planned on your part, but as you were making them I had no idea that would happen. Love it!